Unionville’s Nick Schnaars fight both Springfield defenders — and the elements during a downpour during Friday night’s win over Springfield. SPRINGFIELD — Somewhere, the weather gods were smiling down on Pat Clark and his Unionville football team. Clark, the Indians’ head coach, a long-noted fan of old-school power running football, found his team playing in its perfect element: rain, often with downpours, and mud, making a slow track and all but eliminating the pass game. Yes, 11th seeded Unionville had to play a near-perfect game — and it did — to knock off No. 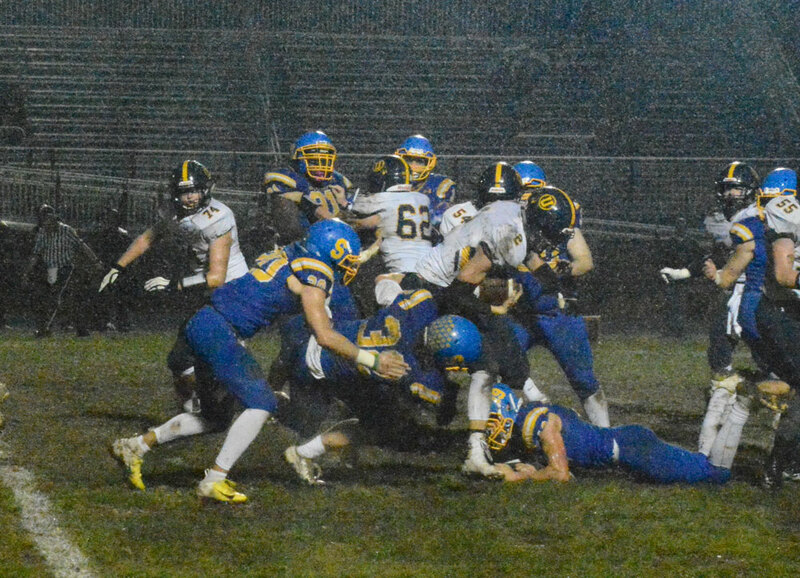 6 Springfield, 9-0, in the opening round of the District One, 5A playoffs, Friday night, but the weather emphasized the Indians’ strengths: the run game and a stout, run-stopping defense. And it was apparent from the get go, that Clark and his coaching staff game-planned exactly right for the weather conditions, which largely prevented the Cougars from using their speed and passing game. Unionville was prepped for an old-fashioned mud slog and it showed. Unionville’s Connor Schilling leaps and tries to make a one-handed catch, Friday night. Unionville’s defense literally stopped the Springfield run game — less than five yards allowed all night — and tormented senior QB Jack Psenicska, who couldn’t stay in the pocket to throw and ended up allowing three interceptions. True, too, the Indians (5-6), who will travel to Radnor next week, continued a run of excellent play to wrap up the regular season. Between a rugged early schedule and growing pains of a young team, Unionville spent much of the season fighting to regain the form that won it a District One, 5A title in 2017. In the last few weeks — and especially Friday night — this Indians’ team began to look a lot more like the team from a year ago. 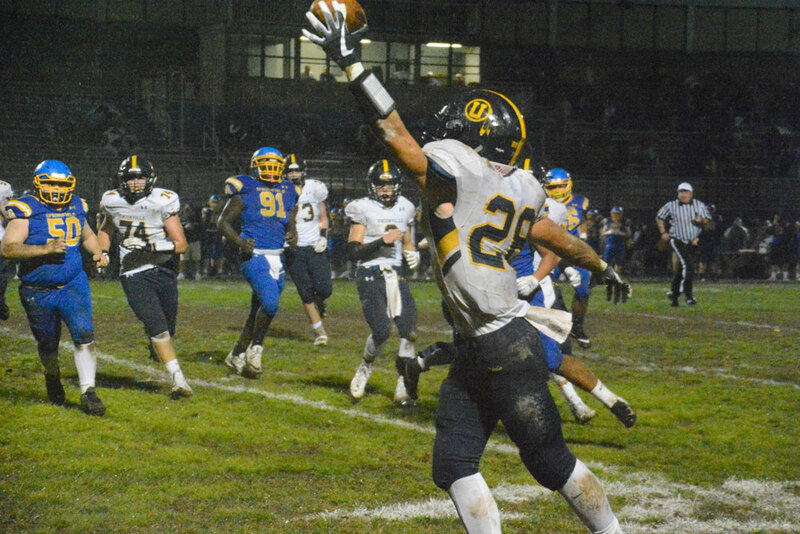 While Unionville’s defense kept finding ways to stop Springfield — including forcing key turnovers and completely stopping its run game — it was the running of senior QB Nick Schnaars and junior RB Connor Schilling that paved the way for its offense. With neither team’s line able to get much purchase on the line of scrimmage, both runners were able exploit seams — and as they became increasingly mud-covered, they got harder to tackle as they literally gave would-be tacklers the slip as defenders couldn’t grab onto their jerseys. 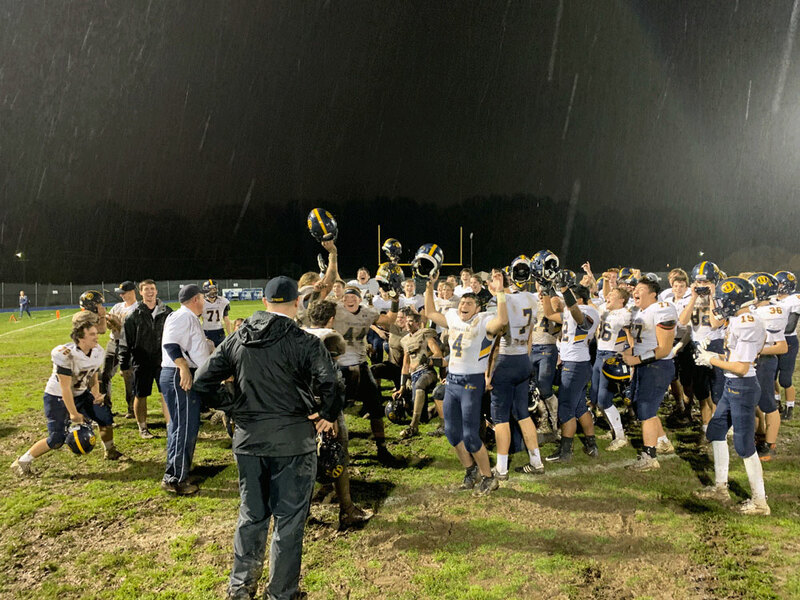 A very muddy — and happy — Unionville football team celebrates a win and a move into the second week of the District One, 5A playoffs. Schilling ended up with 103 yards rushing — and the only TD of the game on a do-or-die 4th and goal from the Springfield 4 — he took a pitch from Schnaars and raced to right-side pylon in the final quarter for what proved to be the game clincher. And while that play and Dominic Braithwaite’s amazing 40-yard field goal were the lone scoring plays, it was another play, one you won’t see in the box score, that might have made all of the difference. Punter Westin Grimm — the Indians’ backup punter behind the injured Declan Boyle — may have made the play of the season in the first half. The punt snap went over his head to the endzone, appearing to be a sure safety (if not a touchdown) for the Cougars. But the sophomore back, who is also a star on Unionville’s rugby squad, managed to grab the ball, elude a couple of tackles and then raced up the left sideline before launching a running punt near the line of scrimmage, rugby style, that sent Springfield back to its own 32. The Indians dodged another crisis in the punt game on the next possession when a second snap went awry — and Grimm could do little but fall on the ball, giving the Cougars the ball on the Unionville 20. But from there the Indians defense shut down Springfield — and Brett Barber missed a 21-yard field goal, ending the Cougars’ best scoring threat. Unionville next will travel to No. 3 seed Radnor, which won a last-second victory over Marple-Newtown, 27-25, Friday night. In 5A action: Kennett, making its first appearance in the District One playoffs since restarting football in 2005, fell to Penn Wood, 40-6. West Chester Rustin beat Oxford, 28-0; Upper Dublin beat Phoenixville, 41-12; Cheltenham beat West Chester East, 28-21. 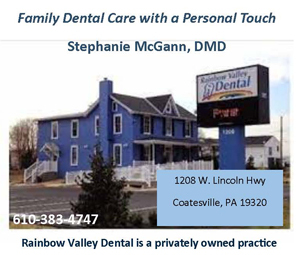 In 6A action: Downingtown West beat Upper Darby, 42-20; Coatesville cruised past Central Bucks East, 48-10; and Downingtown East overwhelmed Spring-Ford, 39-12.